Former Federal Reserve Chair Alan Greenspan was on CNBC’s Closing Bell program today echoing some of the sentiments shared in my post here earlier today. Everyone expects that the growth rate for the fourth quarter is going to be about 2 percent, which is a downward revision from the earlier version. And it may even be less than that. He also looked at the productivity numbers — the main driver of a growing economy — and declared it weak. Capital investment is key to productivity growth. That has slowed down quite dramatically and productivity has followed right along. Pete the Banker: Where’s Our Economic Recovery? 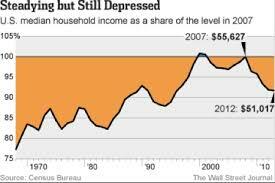 I guess I am just tired of hearing how good it is when most Americans and Oregonians have yet to experience an economic recovery. We are constantly besieged by news that the economy is in recovery, that economic growth is accelerating, that housing is finally emerging from a long slumber. Politicians and the Rah- Rah -Rah trade association crowd continually proclaim that better times and utopia are just ahead. Just be patient and trust us. Jobs will pick up and everything will be fine. Six years and still waiting! Yet the economy has been plagued by slow growth the so called new normal. Demand has been tepid and intermittent. 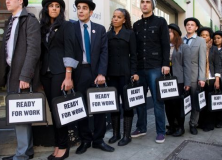 Jobs clip along at a rate of increase of 200,000 to 250,000 per month, when in recovery economists suggested just a few years ago that we needed at least 300,000 to 350,000 per month during recovery to get us to true full employment. The slow recovery has been blamed on a number of factors (Bush of course) with weather and jobs being the main culprits. Like weather hasn’t been around since man emerged from the hunter-gatherer stage. And with jobs we are just fine with waiters and hotel clerks replacing higher paying executive and engineering jobs. And the middle class, we just sort of rediscovered them after they finally decided the new normal was a good excuse for a new Senate. Most troubling from my perspective is the housing industry. The headlines continuously proclaim housing is in recovery. Their main focus has been on housing prices which have been increased given the incessant Federal Reserves QE “infinity” programs and Federal initiatives like HAMP, HARP which have spent $billions to modify mortgages and prevent foreclosure. But continuous rumors of recidivism hampering foreclosure prevention programs undermine Administration claims of success. Yet the fundamentals of the industry are far from solid. Sales of homes remain at 2009 -2010 levels. Existing sales announced this last week were at 8 month lows. Financing is nebulous. Applications have declined massively and purchase applications are dismal. Lack of financing is a primary concern with dependence on government sources dominant. Underwriting standards are unrealistic and dictated by the CFPB, requiring credit ratings in the 700 – 750 range as a minimum. More recently given the flailing real estate sales market, Fannie, Freddie, and the FHA have reverted to “sub-prime” financing in an effort to revive the failing residential capital markets. Sub-prime financing, this time exclusively at the hands of government controlled lending sources has returned. Mortgage Financing provided is 95% of value and higher, with little regard for the risk of default. Worse, the Federal Government is on the verge of re-instituting European Accounting and Banking Standards (Basel Accords) which at best amplified the financial crisis in 2008. These International Standards seem more an attempt to liquefy the international monetary system than provide security to the domestic real estate industry and mortgage financing system. This has been to little avail. Applications continue to fall and private lenders have little appetite for the risk involved in low interest rate, long term mortgages. 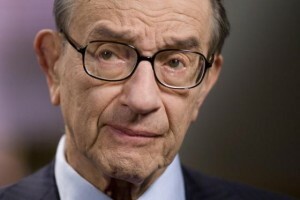 The Feds are no longer subsidizing mortgage market through quantitative easing and price increases are beginning to slow. Fannie Mae and Freddie Mac continue to sell portfolio loans. This Administration, has not let the market correct. Is frightened by the lack of demand in housing and the by lack of response of housing market/housing financing markets to government intervention. As a result the Administration has thrown caution to the wind and through HUD and the FHFA returned to reliance on the very lending factors that caused the 2008 financial collapse, subprime lending. Nor despite repeated assertions does the Administration have any intent of reforming the residential capital markets, inclusive of Fannie Mae and Freddie Mac. The Administration talks a good game, but its actions are at best ineffectual. Consumer demand and housing demand continue to suffer, the result of uncertainty created between the continual promises an emergent vibrant economy and actual muted results. Pete the Banker is a Banker who wishes to remain anonymous after what happened to Joe the Plumber by the President and his shock troops in the 2008 election. He is a member of the Victoria Taft Blogforce. Kitzhaber’s work wife and fake wife plundered his office. Worse? He was only to happy to let them loose on Oregonians — and their moth-filled wallets — as long as no one bothered him with details. It’s hard when you discover the ‘cool’ guy you voted for was actually an egotistical, hair sprayed airhead. Oregonians should have taken John Kitzhaber at his word when he uttered his Nixonesque ‘Oregon is ungovernable’ you won’t have him to kick around anymore epithet in 2002. They should have believed the pundits who said ‘It’s the governor, stupid’. Instead, voters let the perpetually affected, detached and bored executive back into office, whereupon he turned everything over to his unelected wives and handlers. The emails the ex governor tried to destroy, but which were obtained by Willamette Week, show Kitzhaber turned over two of his biggest projects — and biggest failures — to his campaign chief, who ran Oregon’s business in the Columbia River Crossing and Cover Oregon to the benefit of exactly one person: her client, candidate John Kitzhaber. This may come as a surprise, but that’s a Bozo-No-No. When she wasn’t working for the company managing the disastrous light rail program laughingly called Columbia River Crossing, campaign aid Patricia McCaig, Willamette Week reports she was paid to ‘manage’ the program for the Governor. Then, because apparently she’d done such a *great* job with the CRC, Kitzhaber put McCaig in charge of the quickly circling-the -drain Cover Oregon plan. 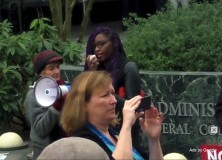 McCaig saw her plan of action clearly. She didn’t want to save the OrBamaCare program, she wanted to save the Governor. The emails also show McCaig orchestrated the state’s legal strategy against Oracle. 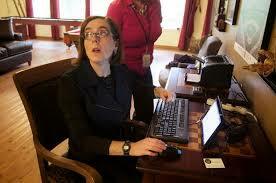 Polling showed voters blamed the governor for Cover Oregon’s failure. McCaig wanted Kitzhaber to demand money back from Oracle. 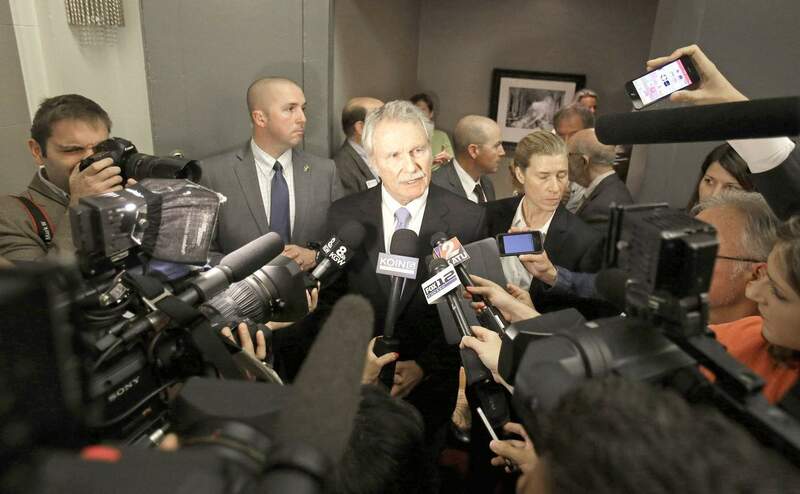 By mid-June, McCaig told Kitzhaber their Cover Oregon media strategy was working. She was thrilled when the media lost interest in the story and didn’t bother to do their jobs anymore. ‘I can pay you now’? I’ll take a double order of conflict of interest, please. Bringing McCaig on to smoke screen Cover Oregon to get re-elected was a slime bag move made by a desperate candidate hell bent on covering up the 3rd term dents to get to the “unprecedented 4th term.” Especially since she had no healthcare experience. That makes it 10 times worse. Why did it take so long to see Kitzhaber was inept? PERS, the Columbia River Bridge, CoverOregon and those goofy commercials? It’s why so many that are not liberal just shook their heads at his third and fourth terms. though he said he changed for this latest campaign — really? Yes, some of us do. Take a Bong, I Mean a Bow, Oregon. 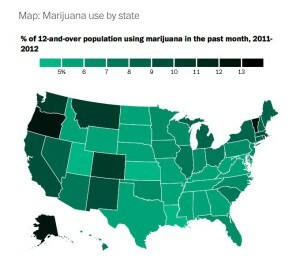 It’s the ‘Greenest’ State. Big changes are on the way and it means your privacy will be further eroded and ever dependent on the whim of a government worker. *This post has been edited to clarify parts which speculate about the fall out of this bill and to include additional supporting documents and links. Oregon Voter Registration process is about to change in a big way. No longer will you be required to register. This will be done automatically by the Secretary of State from your DMV records. There are some caveats. Some are asking: Who will be registered to vote? What will happen to my privacy? What if I don’t want to be registered? What’s the cost? Automatic Voter Registration HB2177 passed House on Feb 20th! It still must pass the Senate and be signed by the new Governor, who is the former Secretary of State until last week. 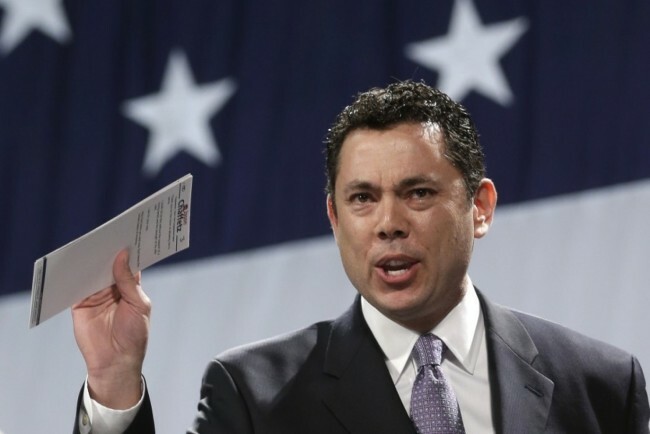 You won’t be able to opt-out at DMV, instead your data will be sent to the Elections Division. They will notify you that you must opt out in the following 3 weeks or you WILL be added to the voter registration rolls. Your private DMV record information including your signature will become part of the public voter registration record. That is a problem for some people, who do not want to be registered, or have their information on a public database. In 2014, Rep. Sal Esquivel R-Medford asked new Oregon Director of Elections Jim Williams about the current process of verifying voter ID from the DMV database. William’s letter in response to Esquivel outlines current practices, but what is troubling to election integrity activists is that though the DMV does send data to Elections Division, the agency only gets the basics: name, address and other demographic data. Under the current system, there is no confirmation of citizenship required. Noncitizens can slip through the cracks and be registered to vote. Oregon’s DMV database still includes names that predate 2008 rules-change, which required proof of citizenship before getting a driver’s license. In the early 2000s 80,000 noncitizens registered to vote and got driver’s licenses (in Washington County). They will not cycle out of the DMV system until 2017. Under President Obama’s Deferred Action on Childhood Arrivals (DACA), noncitizens, including those living in the state of Oregon, can get a driver’s license . Anyone with a driver’s license can currently register to vote online if they are willing to lie and say they are a US citizen. It’s a felony to do so, but the system will accept the person. They will get a ballot. It will count. [Recently, Secretaries of State testified before Congress that the President’s ‘executive amnesty’ will make the identification virtually indistinguishable from that of citizens. Non citizens, they argued, under these new rules could vote. Kansas Secretary of State Kris W. Kobach said even some motor vehicle bureau workers automatically ask customers if they want to register to vote, which some noncitizens in the past have cited as their reason for breaking the law to register. A recent article from Breitbart News Network shows how noncitizens are using false IDs to get driver’s licenses in California. California officials were trying to help noncitizens get drivers licenses; instead they were exposing ID theft. It is such a problem that elected officials decided not to criminalize noncitizens for committing ID theft if they only did it to get a driver’s license. An ongoing nationwide study, the Cooperative Congressional Election Study, revealed that in the election years of 2008 and 2010, enough noncitizens voted to change election outcomes. The authors of that study wrote the Washington Post October 14th, article that details how noncitizens slip through cracks in our electoral system. Under this bill proposed at the request of the Secretary of State, it is entirely up to the Secretary of State to make the qualifying rules. The rules are not stated in the bill. This shift of power from the Legislative branch to the Executive branch is quite astounding. Secretaries change over time, from elections or as we see currently in Oregon, due to other reasons. While Secretary Brown’s staff testified in committee that only proven citizens would be auto registered, there are no assurances from future Secretaries of their same commitment. Instead though this bill, it is the Secretary’s prerogative to decide by administrative ‘rule’. The administrative rule process is easy to change and is not subject to the legislative approval. 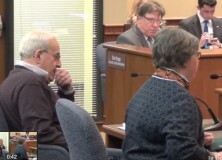 Rep. Carl Wilson R-Grants Pass in the House Rules Committee argued that small counties are already strapped for money to provide basic services and safety for citizens, and opposed HB2177 on the grounds that mandating these changes would be a big problem financially for his county. Ways and Means Committee members have committed to covering the financial costs of implementation, but Wilson isn’t convinced: “I’ve heard this promise before,” he said. Estimated price tag for initial statewide implementation: $1.5 million. 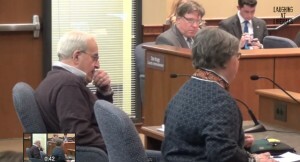 Republican legislators asked why $1.5 million is being spent to implement an opt-out system in a state that already boasts one of the highest voting participation rates in the country. They referenced two security breaches in 2014 at the Secretary of State’s office, and voiced concerns about jeopardizing the privacy of citizens. When the bill was routed through the Joint Ways and Means Committee and onto the Joint Subcommittee on General Government, the discussion got heated. The bill had not traveled the usual route through the Senate Rules to discuss the policy change. Senator Doug Whitsett R-Klamath Falls told Co-Chair of General Government: Senator Elizabeth Steiner-Hayward, D-Portland that she would have to call security to remove him when she attempted to limit his questions about HB2177 to strictly fiscal issues. Janice Dysinger is an Oregonian, patriot and a student of Oregon’s election law. This article first appeared on the Americans for Prosperity, Clackamas website. It has been reprinted by permission. This essay first appeared at the Political Vanguard website. 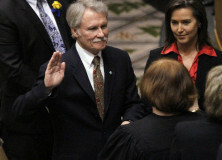 Governor John Kitzhaber left office Wednesday. He resigned because he had broken an ethical contract with the people of Oregon and this time the official media actually bothered to report it. Officially, the Oregon Democrat, who won an unprecedented fourth term of office in November, left under a stink of suspicion. 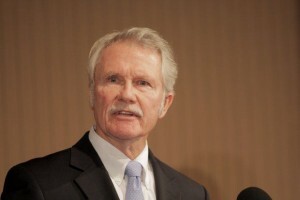 Kitzhaber’s under investigation by the Oregon State Attorney General’s Office, the state ethics commission and the FBI. Even the House Congressional Government Oversight Committee want a piece of him. Unofficially, Oregon’s Governor was brought down by a his ego, environmental hubris, one party rule and an open fly. 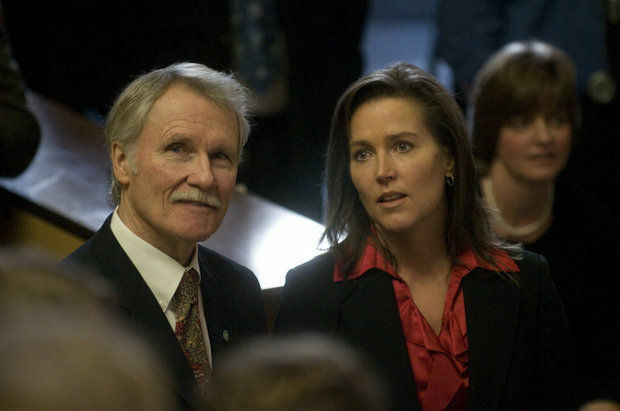 The Governor’s fiancé, Cylvia Hayes, whom Kitzhaber insisted the media (and everyone else) address as ‘Oregon’s First Lady’ (beginning well before he ‘put a ring on it’), is a woman by whom Kitzhaber is clearly wholly beguiled. Hayes cajoled her boyfriend into using his office to advance her and her friends’ careers and arrogate grants and state (read: taxpayer) largesse to her. Kitzhaber was eager to do it. He enlisted the help of his staff to make it happen. It turns out you might be able to do that if you’re just-some-guy with a hot, younger girlfriend, but not if you’re the Governor using other peoples’ money. It wouldn’t be the first time Cylvia Hayes pulled the opportunistic grifter girlfriend act. 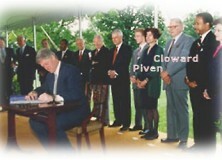 Once married an illegal alien for $5,000.00. She never bothered to tell her Governor boyfriend about the first of her three matrimonial unions. Hayes talked an older boyfriend into buying property to plant an illegal pot farm. He claimed she took the lead on the plan. As a 35 year old woman, she convinced an 81 year old man to loan her $40,000 as a down payment for a house and talked him into a trip to Paris. She got another coot 20 years her senior to cover the loan from other old guy, pay her daily expenses and advance her career. His name is John Kitzhaber. MailOnline has discovered she divorced her second husband, married an Ethiopian for a green card and went away with a lover all in matter of months. 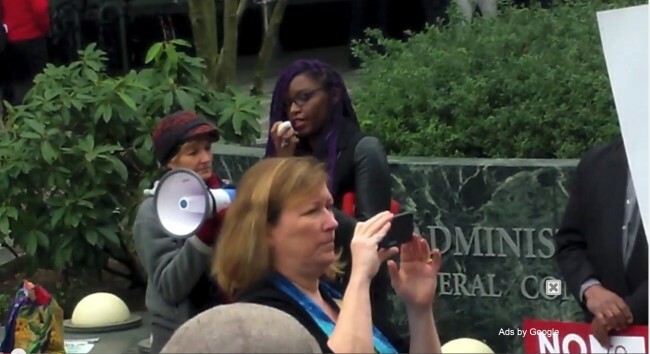 Unfortunately for Kitzhaber, his kind of ‘help’ brought the scrutiny of law enforcement. And it could also put him –and her, due to her failure to report some of her ill gotten fees to the IRS — in matching orange jumpsuits. Of course, most of this information was available before the November election. But this is Oregon.Despite Kitzhaber’s colossal biffing of the ‘OrBamaCare’ plan roll out, Cover Oregon, and a huge failed light rail program, both of which left Oregon’s taxpayers a half BILLION dollars in the hole, Oregon went bluer in the last GOP tidal wave election. Oregon, being a one-party state with a slavishly Democrat devoted media and less than robust GOP, hired back the jeans-wearing old guy. Can you blame Kitzhaber for thinking he was bullet proof? 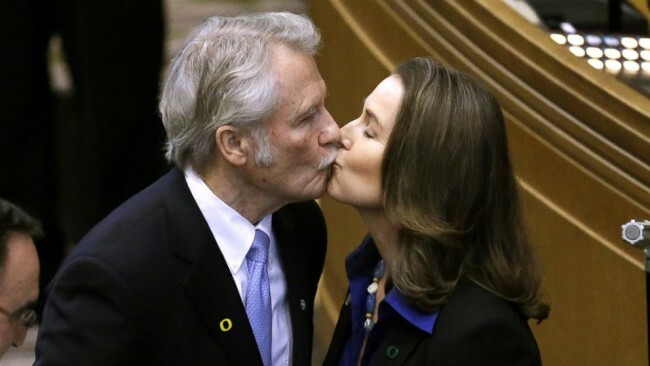 The truth is, Kitzhaber let his grifter girlfriend get her way because they hold the same radical environmental views. He believed he would get cover from his fawning media, ironically whom he blamed for his fall from grace. He knew his fellow Democrats in the legislature would do his bidding and look the other way and indeed they did. After it became known Kitzhaber asked his staff to destroy emails which, we now know, show his willingness to satiate his fiancé’s seemingly insatiable desire for more taxpayer money and power. After the Feds and AG’s office said despite the Governor’s efforts to slow-roll document discovery under open records law, they’d investigate anyway. After the election with the Democrat leitmotif firmly established, the daily (dying) newspaper of record called for Kitzhaber’s resignation. The Secretary of State would take over. Kate Brown, an even more radical environmentalist than Kitzhaber and his girlfriend, has now taken control of Oregon’s governor’s office. She has the added bonus of a being, as the LGBT community helpfully added mere moments after after Kitzhaber announced his intent to resign, the first ‘bi-sexual Governor’ ever, ever. Now Democrats can continue the same — or worse — programs and plans without John Kitzhaber to kick around anymore. Out of sight, out of mind. Change the subject. Can that be said today, when Washington’s Birthday is no longer a National Holiday, and the nation’s children learn more in progressive liberal, politically correct, cultural relativist government schools about “the life of Mohammad” than the life of George Washington, and celebrate such farcical concocted “holidays” as “Kwanzaa” and “Cinco de Mayo” while George Washington’s Birthday Holiday is no more? George Washington, first, last, and always a soldier serving God and Country, was heralded in his time as the “Apostle of Liberty,” the “Indispensable Man,” having with his ragtag band of American citizen-soldiers of the Revolutionary Army defeated the most powerful military nation in the world in eight years of war to establish our American independence, our freedom. He did not seek the Presidency–it sought him. He was elected unanimously –twice. He was offered the Presidency for life. But he stunned the world when he refused a third term and even monarchial rule, and, instead walked away from power to return to his home as citizen. He was, is, our American “Cincinatus,” who, like the Fifth Century (BC), Roman general, fought the battles of the nation, held unequaled power, but did not covet it, and instead returned to his farm. 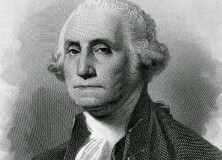 So was Washington satisfied to be a citizen of a free America, rather than its ruler. Are those words still true to this generation of Americans? Those words of Adams, Jefferson, Gen. Harry Lee, the English King George III and the French Emperor Napoleon, all speaking with awe at the example of Washington’s life as one which would be taught “not only in the present age, but in future generations,” as John Adams said, and his memory “held dear..to all freemen” as Napoleon said? Is Washington still “First in war. First in peace. First in the hearts of his countrymen,” as Gen. “Light Horse” Harry Lee said of him? If not, why not? Are we Americans better for it, as a people, a nation, when we honor no longer the one American who was so universally acknowledged in his time — and up to this generation of transformed Americans — as the Greatest American, the Father Of Our Country? He who defeated tyranny, held ultimate power by acclamation and then walked away from it to preserve the freedom he had created as a soldier? He who lived his life for God and Country? Are the children of a nation, like the children of a family, really better off, better people, by forgetting their father, being without their father, forgetting the virtues their father taught, being orphaned? 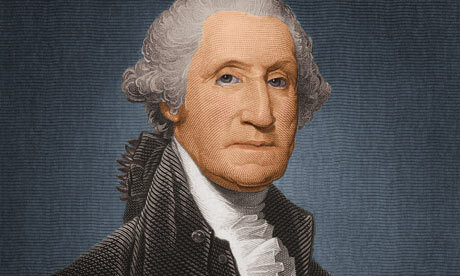 We Americans today, whatever our ages, whatever our ancestry, ethnicity, or race, as Americans, are the children of the American Founding Fathers, including in the particular, George Washington, whom the Founding Fathers proclaimed the greatest among them, the Father Of Our Country. May both the God that George Washington so faithfully served bless and keep him; may the Country he so loyally served always remember and honor him; and may the lessons of his life be learned in this and every generation so that the freedom he fought for and created may not wither and weaken, to be destroyed by enemies foreign, or domestic. FOR GOD AND COUNTRY FOREVER; SURRENDER TO TYRANNY–NEVER! I’ll Be On FM News 101 KXL Friday 9-Noon. Lots to Talk About. They’re side shows. Even they think so. This video was taken by Daylight Disinfectant recently at a confab discussing social justice and the effort to fight ‘the man’. First, very few were in attendance. Second, even fewer were paying attention. Looks like the old days. Friday-at-fours. I’ll Be On KXL FM 101 9-Noon Wednesday. 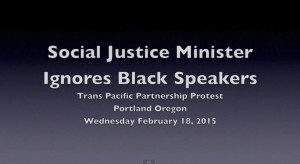 Will Kitzhaber Be There? Before there was King Barack Hussein Obama, there was Kitzhaber, King John of Oregon. But it’s the same story, writ small. Shared by John Trudel, but written by one of his friends who wishes to remain anonymous. 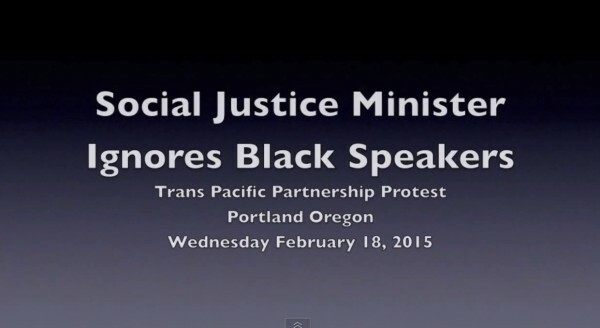 Here is a great postmortem on the Epic Fail of King John’s Marxism in Oregon, just in. I hope there will soon be one written for the Epic Fail of King Obama’s Alinsky communism in America. Once again the immorality of the earth worshipers raises its evil head in Oregon as a Governor gets caught with his hand in the $olar cookie jar. Fortunately, thanks to the corruption of the Democrat Party activists in the state media they were able to divert his guilt long enough to get him re-elected for his 4th term beginning last month and keep the seat safe. Now they have a Stalinist in place of this Leninist who will maintain his graft and corruption schemes for another decade or two. Welcome to Moscow on the Willamette. John Kitzhaber was Governor beginning twenty years ago when he used his Robert Redford looks to win the election after election with the ladies and maintained it then for two four year terms. He was as he called it a failed Governor taking the state from the middle of the pack to near the bottom in every category you could measure. His economic programs were to protect the spotted owl and closing state forests to proper management and running the lumber industry pretty much out of the state. Now those lumber towns have around a 30% unemployment rate with all of the drug, divorce and addiction issues that go along with them. Once he completed his two terms he changed his occupation, but not his passion which was damaging the forest industry and renewable energy. During the eight year hiatus from Governor he struck up a relationship with another dirt worshiper who had a smalltime renewable energy company in Bend Oregon. Cylvia Hayes owned a pretty shaky operation from the start that specialized in solar energy. She has always been money hungry and even talked one of her boyfriends into investing into a pot growing operation that failed and nearly was arrested. She is an attractive woman who sells her assets to the highest bidder and when she met this John she saw a sugar daddy she could not pass up. He divorced his 2nd wife who he has a son with and they became a couple destined for the high lifestyle of Salem Oregon. Once he regained the Governorship they became the consummate corrupt politicians. Using the smokescreen of Global Warming he began fleecing the state with a fury. Like all Dems in this state he thought he was being cute by funneling it through his spouse so he could keep his hands clean. She set herself up as a lobbyist while working out of the Governor’s office and even had business cards printed as the State First Lady even though they were simply shacking up. He was a huge proponent of solar and wind energy to protect mother earth and satisfy all of the dirt worshipers in Portlandia. These companies all lost money like Solyndra, but the Dems were able to deflect the blame from Kitzhaber since he was a Marxist just like them and needed to make Oregon more Marxist. The interesting part of Oregon is that although it is considered a very liberal state, once you leave the twenty mile circumference of Portland the rest of the state is very conservative. Like most western states outside of California, the vast majority of the land mass is either independent or conservative it is simply overwhelmed by all of the gummit workers in P-Town. The only reason they are able to maintain their Soviet model is the Repubs are so inept they cannot offer a decent alternative. This election they ran 120 year old man who tried to mirror Romney right down to being a Mormon who would not go on offense. He was so bad, like Romney in the final debate he was Mr. Nice and actually read his final statement of why he should be elected off his laptop. He couldn’t even come up with a reason why he was running so why should the voters. So Kitzhaber sailed to victory, but a funny thing happened as they left the coronation, one of the communist rebel newspapers actually did its job. The Willamette Weekly which is the most liberal paper in the state was the only newspaper that stayed on the story through the entire campaign and forced the floundering Oregonian to cover parts of it. The shoes began to fall and then a boot fell out when it was reported his fiancée did not report $180,000 in fees from a renewable energy firm on her taxes. All of the sudden tax evasion became something even people in Portland could understand and then his attempts to destroy evidence was revealed and jail time became a real possibility so the Party deserted him and he had to resign. This is the problem when you have Marxists in control of your state for thirty years. They are the party of relativism and hate the Bible with all of its antiquated rules. These are fundamental cultists of the earth which gives them a sense of well being, but no moral direction. They simply make it up as they go and cover every lie or theft with moral justification. This Party has been in power for so long they have written all of the rules and laws to maintain their control so he believed he was a protected class and would get away with it. The problem he ran into is he did not want to report her tax returns to the elections board and so they hid the income from the people, but that type of income is going to be reported on the other side and eventually will be revealed and was. This is what happens when you do not have Christians or God leading your leaders’ lives. Oh they may look and sound cool with their Robert Redford mustache, hair and blue jeans, but under that façade is a lie. He had no problem leaving his wife and kid for a younger wife to match his youthful looks, since she was hot for him and why not? He was able to kick business her way since it was helping the environment or saving the earth. After a while he was saving the earth more and more while Oregonians were losing jobs and money in his boondoggles. One windmill farm in Eastern Oregon cost Oregonians over fifty million dollars. Finally, he was making so much money in his little scratchy, scratchy system he could not launder the money fast enough and finally they were caught by the IRS. Now he is going to join some of his friends from big Chicago. John Kitzhaber is the perfect symbol of a radical environmentalist. He worships a man god cult which all of the rules are made by man. He believes man is a god and he is godlike so he makes the rules. The problem is man is evil and will do things that are evil to satisfy the flesh. He of course is all about the environment and satisfying his needs which became more craven until he could not maintain his cravings for money and the hot younger wife. He believed his gods would satisfy and found they simply made him more and more empty, so now he is simply a hollow shell on his way to a very ugly trial. The Cinderella wedding and a final ride into the sunset have been upset by a collapsed bridge and a tumble into the Columbia. God is good, all the time and all the time God is good in his time. So much of this godless Marxism is being exposed that there may be an opening for his power to be revealed to his second favorite land, America. 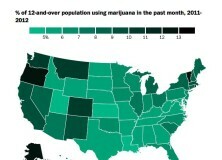 Oregon is America starting to change and this small state is taking a huge step in that direction. The House Governmental Oversight Committee wants failed Cover Oregon records. Members of the House Committee on Oversight and Government Reform issued to Kitzhaber’s office a wide-ranging demand for documents on Friday, the very day the governor announced he was resigning. The letter cites a recent report that highlighted concerns sparked by a Kitzhaber staffer’s attempt to have thousands of emails inadvertently stored from the governor’s personal email account removed and deleted from state archives. A governor’s spokeswoman said the intent was to preserve emails that pertained to the public’s business, but not ones deemed personal. Congressman Jason Chaffetz’s committee wants to make sure Kitzhaber isn’t trying to cover up what’s become known colloquially as the Cover-Up Oregon health plan. But here’s another angle on the story: Kitzhaber may have colluded to keep the Cover Oregon site down altogether, instead of constantly malfunctioning to help the Governor’s re-election campaign. And a set of emails leaked to Willamette Week in November showed that McCaig directed meetings to discuss the content and timing of an advisory committee’s recommendation on Cover Oregon’s future. Three weeks later, the committee publicly recommended closing down the Oracle-built exchange and moving to the federal one. Oracle has accused the state of shutting down the exchange to help Kitzhaber’s reelection campaign. Friday was a very bad day for the Oregon chief executive.